The One and Only Ivan NPR coverage of The One and Only Ivan by Katherine Applegate. News, author interviews, critics' picks and more. Ivan, a silverback gorilla who has spent his life in a down-and-out circus-themed mall, meets Ruby, a baby elephant, and decides that he must find her a better life. 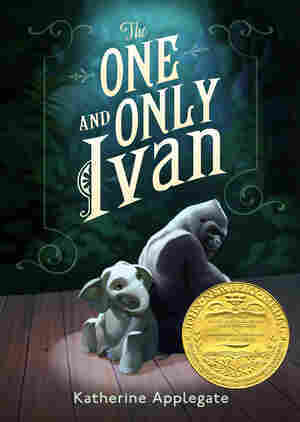 The novel is illustrated by Patricia Castelao and inspired by a real gorilla named Ivan, who lived in a mall and later became a celebrity at the Atlanta Zoo. The names are mine, but they're not me. I am Ivan, just Ivan, only Ivan. I suppose you think gorillas can't understand you. Of course, you also probably think we can't walk upright. I've learned to understand human words over the years, but understanding human speech is not the same as understanding humans. Patient is a useful way to be when you're an ape. I used to be a wild gorilla, and I still look the part. I have a gorilla's shy gaze, a gorilla's sly smile. I wear a snowy saddle of fur, the uniform of a silverback. When the sun warms my back, I cast a gorilla's majestic shadow. In my size humans see a test of themselves. They hear fighting words on the wind, when all I'm thinking is how the late-day sun reminds me of a ripe nectarine. I'm mightier than any human, four hundred pounds of pure power. My body looks made for battle. My arms, outstretched, span taller than the tallest human. My family tree spreads wide as well. I am a great ape, and you are a great ape, and so are chimpanzees and orangutans and bonobos, all of us distant and distrustful cousins. I know this is troubling. I too find it hard to believe there is a connection across time and space, linking me to a race of ill-mannered clowns. Chimps. There's no excuse for them. I live in a human habitat called the Exit 8 Big Top Mall and Video Arcade. We are conveniently located off I-95, with shows at two, four, and seven, 365 days a year. Mack says that when he answers the trilling telephone. Mack works here at the mall. He is the boss. I work here too. I am the gorilla. At the Big Top Mall, a creaky-music carousel spins all day, and monkeys and parrots live amid the merchants. In the middle of the mall is a ring with benches where humans can sit on their rumps while they eat soft pretzels. The floor is covered with sawdust made of dead trees. My domain is at one end of the ring. I live here because I am too much gorilla and not enough human. Stella's domain is next to mine. Stella is an elephant. She and Bob, who is a dog, are my dearest friends. At present, I do not have any gorilla friends. My domain is made of thick glass and rusty metal and rough cement. Stella's domain is made of metal bars. The sun bears' domain is wood; the parrots' is wire mesh. Three of my walls are glass. One of them is cracked, and a small piece, about the size of my hand, is missing from its bottom corner. I made the hole with a baseball bat Mack gave me for my sixth birthday. After that he took the bat away, but he let me keep the baseball that came with it. A jungle scene is painted on one of my domain walls. It has a waterfall without water and flowers without scent and trees without roots. I didn't paint it, but I enjoy the way the shapes flow across my wall, even if it isn't much of a jungle. I am lucky my domain has three windowed walls. I can see the whole mall and a bit of the world beyond: the frantic pinball machines, the pink billows of cotton candy, the vast and treeless parking lot. Beyond the lot is a freeway where cars stampede without end. A giant sign at its edge beckons them to stop and rest like gazelles at a watering hole. The sign is faded, the colors bleeding, but I know what it says. Mack read its words aloud one day: "COME TO THE EXIT 8 BIG TOP MALL AND VIDEO ARCADE, HOME OF THE ONE AND ONLY IVAN, MIGHTY SILVERBACK!" Sadly, I cannot read, although I wish I could. Reading stories would make a fine way to fill my empty hours. Once, however, I was able to enjoy a book left in my domain by one of my keepers. The freeway billboard has a drawing of Mack in his clown clothes and Stella on her hind legs and an angry animal with fierce eyes and unkempt hair. That animal is supposed to be me, but the artist made a mistake. I am never angry. Anger is precious. A silverback uses anger to maintain order and warn his troop of danger. When my father beat his chest, it was to say, Beware, listen, I am in charge. I am angry to protect you, because that is what I was born to do. Here in my domain, there is no one to protect. My neighbors here at the Big Top Mall know many tricks. They are an educated lot, more accomplished than I. One of my neighbors plays baseball, although she is a chicken. Another drives a fire truck, although he is a rabbit. I used to have a neighbor, a sleek and thoughtful seal, who could balance a ball on her nose from dawn till dusk. Her voice was like the throaty bark of a dog chained outside on a cold night. Children wished on pennies and tossed them into her plastic pool. They glowed on the bottom like flat copper stones. The seal was hungry one day, or bored, perhaps, so she ate one hundred pennies. Mack said she'd be fine. Mack calls our show "The Littlest Big Top on Earth." Every day at two, four, and seven, humans fan themselves, drink sodas, applaud. Babies wail. Mack, dressed like a clown, pedals a tiny bike. A dog named Snickers rides on Stella's back. Stella sits on a stool. It is a very sturdy stool. I don't do any tricks. Mack says it's enough for me to be me. Stella told me that some circuses move from town to town. They have humans who dangle on ropes twining from the tops of tents. They have grumbling lions with gleaming teeth and a snaking line of elephants, each clutching the limp tail in front of her. The elephants look far off into the distance so they won't see the humans who want to see them. Our circus doesn't migrate. We sit where we are, like an old beast too tired to push on. After our show, humans forage through the stores. A store is where humans buy things they need to survive. At the Big Top Mall, some stores sell new things, things like balloons and T-shirts and caps to cover the gleaming heads of humans. Some stores sell old things, things that smell dusty and damp and long-forgotten. All day, I watch humans scurry from store to store. They pass their green paper, dry as old leaves and smelling of a thousand hands, back and forth and back again. They hunt frantically, stalking, pushing, grumbling. Then they leave, clutching bags filled with things—bright things, soft things, big things—but no matter how full the bags, they always come back for more. Humans are clever indeed. They spin pink clouds you can eat. They build domains with flat waterfalls. But they are lousy hunters. Some animals live privately, unwatched, but that is not my life. My life is flashing lights and pointing fingers and uninvited visitors. Inches away, humans flatten their little hands against the wall of glass that separates us. The glass says you are this and we are that and that is how it will always be. Humans leave their fingerprints behind, sticky with candy, slick with sweat. Each night a weary man comes to wipe them away. Sometimes I press my nose against the glass. My noseprint, like your fingerprint, is the first and last and only one. The man wipes the glass and then I am gone. Here in my domain, I do not have much to do. You can only throw so many me-balls at humans before you get bored. A me-ball is made by rolling up dung until it's the size of a small apple, then letting it dry. I always keep a few on hand. For some reason, my visitors never seem to carry any. In my domain, I have a tire swing, a baseball, a tiny plastic pool filled with dirty water, and even an old TV. I have a stuffed toy gorilla, too. Julia, the daughter of the weary man who cleans the mall each night, gave it to me. Tag was my twin sister's name. Julia is ten years old. She has hair like black glass and a wide, half-moon smile. She and I have a lot in common. We are both great apes, and we are both artists. It was Julia who gave me my first crayon, a stubby blue one, slipped through the broken spot in my glass along with a folded piece of paper. I knew what to do with it. I'd watched Julia draw. When I dragged the crayon across the paper, it left a trail in its wake like a slithering blue snake. Julia's drawings are wild with color and movement. She draws things that aren't real: clouds that smile and cars that swim. She draws until her crayons break and her paper rips. Her pictures are like pieces of a dream. I can't draw dreamy pictures. I never remember my dreams, although I sometimes awaken with my fists clenched and my heart hammering. But even though I draw the same things over and over again, I never get bored with my art. When I'm drawing, that's all I think about. I don't think about where I am, about yesterday or tomorrow. I just move my crayons across the paper. If I get tired and need a break, I eat my crayons. I think I've always been an artist. Even as a baby, still clinging to my mother, I had an artist's eye. I saw shapes in the clouds, and sculptures in the tumbled stones at the bottom of a stream. I grabbed at colors—the crimson flower just out of reach, the ebony bird streaking past. I don't remember much about my early life, but I do remember this: Whenever I got the chance, I would dip my fingers into cool mud and use my mother's back for a canvas. She was a patient soul, my mother. Someday, I hope I can draw the way Julia draws, imagining worlds that don't yet exist. I know what most humans think. They think gorillas don't have imaginations. They think we don't remember our pasts or ponder our futures. Come to think of it, I suppose they have a point. Mostly I think about what is, not what could be. I've learned not to get my hopes up. When the Big Top Mall was first built, it smelled of new paint and fresh hay, and humans came to visit from morning till night. They drifted past my domain like logs on a lazy river. Lately, a day might go by without a single visitor. Mack says he's worried. He says I'm not cute anymore. He says, "Ivan, you've lost your magic, old guy. You used to be a hit." It's true that some of my visitors don't linger the way they used to. They stare through the glass, they cluck their tongues, they frown while I watch my TV. "He looks lonely," they say. Not long ago, a little boy stood before my glass, tears streaming down his smooth red cheeks. 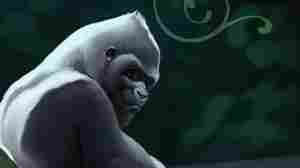 "He must be the loneliest gorilla in the world," he said, clutching his mother's hand. At times like that, I wish humans could understand me the way I can understand them. It's not so bad, I wanted to tell the little boy. With enough time, you can get used to almost anything. From The One And Only Ivan by Katherine Applegate. Copyright 2012 by Katherine Applegate. 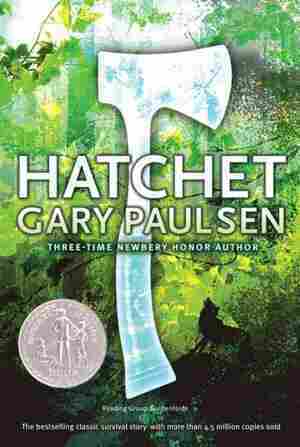 Excerpted by permission of HarperCollins Children's Books.